There are moments in history which will always be stuck in my mind. Moments like when Chris gave me my engagement ring. When I said I do in the chapel at Ohio Northern University. When each of my boys was born. When I got the call about about my dad’s death. And today I remember what I was doing and where I was when the Twin Towers in NYC were hit by airplanes on September 11, 2001. I, like many others, was at work. I was processing orders for our mat board business and Bubba, one of the guys that worked for us, was there as well. I heard it on the news on the radio first and we stared at each other in disbelief. As we listened to the reports we were in shock. I went out to our van and started it up so we could watch the tv in the van and see the live reports. I will never forget. I also tried to get hold of both of the boys at school . I did not know what was happening. I did not know if they were in any danger but I just needed to talk to them. I think everyone felt that way. Chris called and I felt better that I had at least been able to talk to him as well. How can it be so along ago that this happened and yet the memory is so vivid in my mind of that day? 2001 is a long time ago. But yes – I do remember it as if it were yesterday. I think there will always be days like this that are embedded in our memories. So today I remember. I grieve along with those who lost loved ones. I pray for those whose lives were forever changed as a result of these attacks. I pray for a safer world. I pray for all of the refugees in the world who are trying to escape horrible conditions in countries that no longer are the countries that they once were. I still have hope. I really do. I know that our world is not perfect but I also know that one small action can turn the tide. Start small. Maybe just a smile. Be kind. Be patient. Be forgiving. Be loving. Change will come. Persevere. 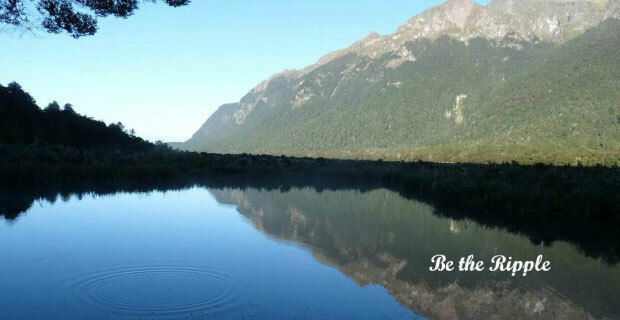 Be the ripple. I remember that my brother and I were driving to school. We heard the news on the radio and couldn’t believe our ears until we kept flipping channels and hearing the same thing. Thanks for reminding us to be a ripple . I know it is a hard day for so many but there is always hope. Hope. It is my word for 2015. Thanks for the reminder. Caleb was home sick from school that day and I was caring for a friend’s son. Randy phoned to tell me about the attack. I turned on the TV and, although the boys did not seem to be watching, they were. Soon they were constructing towers from wooden blocks and flying toy airplanes into them. That really hit home for me in a personal way. Wow. That would have been difficult to see as the boys flew airplanes into block towers. That would have been VERY difficult for me to see. Thanks for sharing. I was working at Walgreens in the pharmacy and somebody told us through the drive through window. We thought it was a joke. The pharmacist bought a TV and we watched it. Shortly after that we got so busy from people panicking and filling their scripts. You never forget where you were, do you? I bet people were panicked. Understandable when the unexplainable happens. Very well put my friend. I do remember this event like yesterday too. The one I will never forget is the day President Kennedy was shot. Our teacher told us and I thought he was joking. Innocence was over. I was in school and remember one of my friends coming over to me before class started saying, “did you hear?”. I hadn’t. I had already been at school. I went to my first class and we watched the news. We watched the news all day and there were questions and a lot of unknowns that day. I will always remember the chaos that was felt nationwide that day. Everyone remembers times like these I know. It is a good thing to be able to remember and not forget the times that have shaped our country and the history of it. Even the sad events.